Night View Assist Plus is only an aid and is not a substitute for attentive driving. Do not rely on the Night View Assist Plus display. You are responsible for the distance to the vehicle in front, for vehicle speed and for braking in good time. Drive carefully and always adapt your driving style to suit the prevailing road and traffic conditions. In addition to the illumination provided by the normal headlamps, Night View Assist Plus uses infrared light to illuminate the road. Night View Assist Plus camera : picks up the infrared light and displays a monochrome image in COMAND. The image displayed in COMAND corresponds to a road lit up by highbeam headlamps. This enables you to see the road's course and any obstacles in good time. If pedestrian recognition is activated, pedestrians recognized by the system are highlighted in the Night View Assist Plus display. Light from the headlamps of oncoming vehicles does not affect the Night View Assist Plus display in the multifunction display. This is also the case if you cannot switch on the high-beam headlamps due to oncoming traffic. Infrared light is not visible to the human eye and therefore does not glare. Night View Assist Plus can therefore remain switched on even if there is oncoming traffic. • the SmartKey is in position 2 in the ignition lock. • reverse gear has not been engaged. ■ Make sure that COMAND is switched on. The Night View Assist Plus display appears in the COMAND display. You can read about how to adjust the brightness of the COMAND display in the COMAND operating instructions. The infrared headlamps only switch on when the vehicle is being driven at speeds of approximately 6 mph (10 km/h). This means that you do not have the full visual range while the vehicle is stationary and cannot check whether Night View Assist Plus is working. Animals are not recognized by pedestrian recognition. Night View Assist Plus is able to recognize pedestrians by typical characteristics, e.g. a silhouette in the shape of a person. If pedestrian recognition is active, symbol 4 appears. If pedestrians are detected, they are highlighted with framing 3. If the pedestrian recognition system has brought a pedestrian to your attention, look through the windshield to evaluate the situation. The actual distance to objects and pedestrians cannot be gaged accurately by looking at a screen. It may be the case that objects are highlighted as well as pedestrians. If the windshield in front of the camera is fogged up or dirty on the inside or outside, the Night View Assist Plus display is affected. ■ To defrost: check the automatic air conditioning settings and fold down the camera cover . 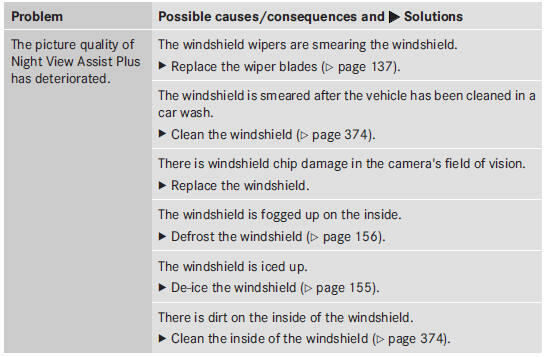 ■ To defrost the inside of the windshield: fold down the camera cover and clean the windshield .